Attached is a picture of my German Shepherd. She is my baby girl and the love of my life. Her name is Hannah and she was 4 years old on April 6th of this year. She enjoys adventure walks to the woods or the lake as seen in the attached picture. Hannah’s home town is Frisco, Texas. She is a Canine Good Citizen and a very good guard dog. If you look closely at the picture, you will notice a tiny piece of the corner of her tongue that is missing. When Hannah was about one year old and ready for her dinner, only her mama was not home from work yet. Hannah decided to take matters in to her own paws and tried to open a pull top can of wet dog food. She removed this can of food from the cabinet, in the kitchen, and took to the back yard through her doggy door. She also took her dog dish outside. When I got home from work and was looking for her dog dish…she got very excited and showed me the dish and the very dented can of wet food in the back yard. The pull top ring was missing from the can as was the label. I think she pinched her tongue in the process. It took about a week before the tip fell off. Not much the Veterinarian could do but he did love the story and said Hannah was too smart for her own good. I hope you enjoy the picture. 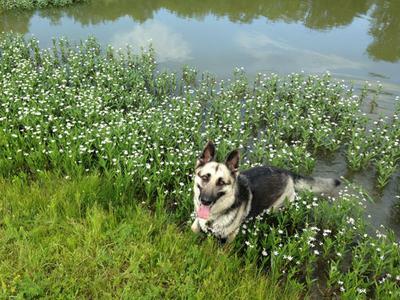 Please enter us in the GSD Photo Contest. Thank you! Beautiful girl Hannah is!!! She is a Lucky girl to have a momma like you. German Shepherds are Amazing breed. Take good care of your Hannah and she will take care of you always!! !